Over the last few months I've suffered through (among many others) The Theory of Everything, The Imitation Game and (ugh) American Sniper, all self-important sludge cinema where important people have important conversations while a string-based score gently swells in the background. Occasionally the lead will gaze off into the middle distance and pronounce something so impossibly wise that, just for a second, the very world appears to revolve around him. I'm so damn tired of this thunkingly portentous rubbish. Set in 1965, Selma chronicles Dr Martin Luther King Jr's (David Oyelowo) organisation and participation in voting rights activism. The town of Selma, Alabama is infested with virulent racists, ruled with an iron rod by thuggish cop Wilson Baker (David Dwyer) and governed by segregationist dinosaur George Wallace (Tim Roth). The stupidity and violence baked into the town makes it the perfect stage for Dr King, whose philosophy of non-violence is most powerful when contrasted with petty-minded barbarism. What happens in this insignificant town soon comes to define the entire protest movement, with national news filled with dramatic footage from Selma of peaceful demonstrators falling under the cop's billyclubs. Dr King's tactics crank up the pressure on President Johnson (Tom Wilkinson), whose delaying a bill on removing voting restrictions begins to look more like cowardice than prudence. 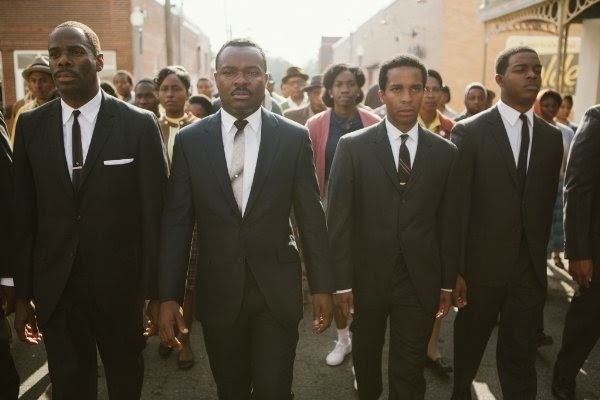 To get this out of the way early on; Selma is a good film. DuVernay chronicles these events as if she happened to be present with a camera, taking us from the front-lines of the marches, to the back rooms of churches where tactical discussions take place and right up to high level political discussions in the Oval Office. There's a easy confidence in way we follow Dr King through the various spheres he occupies, simultaneously playing father, husband, politician, preacher, leader and icon. Similarly there's a careful eye for emphasising violence - though the camera cuts away from the moment of impact - excellent sound work and editing emphasises the repulsiveness of the cop's brutality. She's aided by an impressive cast who're obviously conscious of the importance of their roles. Stand-outs in the supporting cast are the (always excellent) Wendell Pierce as Rv. Hosea Williams, Carmen Ejogo's embattled yet dignified Coretta King and Oprah Winfrey (whose acting skills are often overlooked) as Annie Lee Cooper. The film is peppered with cameos from excellent actors; with Cuba Gooding Jr, Martin Sheen and Dylan Baker all popping up for a scene or two and impressing. Great as the cast is, it's bound together by the considerable gravitas of David Oyelowo's Martin Luther King. 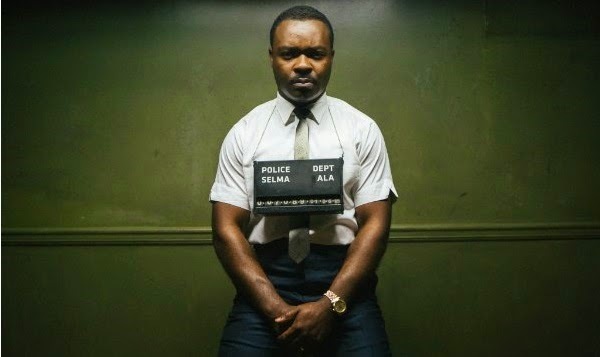 It's difficult to imagine any other actor coming at this role as successfully as Oyelowo does. During his thunderous speeches, which combine revolutionary rhetoric with evangelical preaching, we get a taste of his intense charisma, making it easy to understand why he among many others took leadership of the civil rights struggle. But outside of the speeches Selma's Dr King is a frustratingly distant figure, hemmed in by the demands of a script that (quite understandably) can't help but beatify him. This leads to sequences where other characters talk at or about Dr King while he remains quietly statuesque. This comes to a head in two scenes; the first where his wife is confronts him on his infidelities and he takes a long pause before confirming that he only loves her and the second when he decides, after the police have cleared a path for his march, to turn around and walk back to the church. 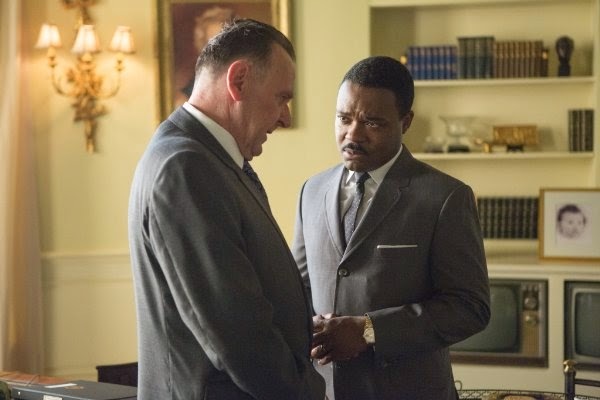 Oyelowo's Dr King with Tom Wilkinson's LBJ. In both scenes he remains quiet and Sphinx-like, the film making no effort to inquire on what his thoughts might be. This extends to his private conversations, practically all couched in slow, thoughtful, statesman-like language. Real people simply don't talk like this, resulting in overcooked conversations that bristle with too much extra-narrative gravitas. It's absolutely understandable for the film-makers (and anyone else for that matter) to be in awe of Dr King, but reverence doesn't lead to incisive cinema. This makes Selma 'merely' an excellent historical recreation. Taken on those grounds it's an undoubted success: the obvious care and attention lavished on every frame of the film makes it an educational watch. But simply portraying events as they happened makes the film a straight history lesson, content to teach the established facts rather than make new enquiries of its own. So, sadly, Selma lands squarely in traditional biopic territory, stuffed full of self-consciously important conversations between actors doing impressions of politicians while a string-based score ensures that the audience is feeling particular emotions at particular times. Admittedly it's a very good example of the biopic genre - quite a bit ahead of The Imitation Game and way, way ahead of The Theory of Everything and American Sniper - but unfortunately it's still mired in the same old conservative genre trappings.